If time itself is a dimension like length and height and width, then Hawking says the fabric of time contains imperfections we could take advantage of. A smooth billiards ball has microscopic crevices, and so does spacetime. We'd need to find a true "wormhole" and prop it open, and then head on through. The caveat, of course, is that we'd be facing heavy radiation feedback concerns (a bit like the screeches you hear at rock concerts) and even without that problem, that we would create paradoxes by messing around with historical events in the past. For this reason, Hawking believes travel to the past may well be impossible. 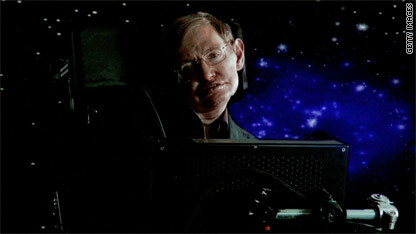 Hawking says if we can get close to the speed of light, a "cosmic speed limit" will kick in to prevent going any faster. 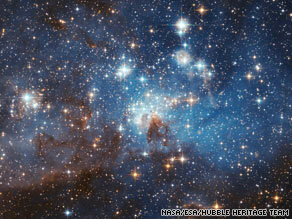 Approaching roughly 186,000 miles per second, time will slow down for the traveler vs. the observer. When the traveler emerges, they will have jumped into the future. We just have to develop an engine that can go that fast. Don't try this on the Autobahn, folks. Turns out Cosmonaut Sergei Avdeyev is said to hold the record for the most time traveled into the future: about 20 milliseconds. His cumulative experience aboard Russian space station Mir gave him an edge over the competition. Hawking discusses in his documentary how orbiting global positioning satellites must have their timekeeping adjusted every so often because of the relative time slowdown. This one might be a cop-out, but many scientists (including Hawking) argue that time travel to the past is paradoxical and potentially impossible. In lieu of a Wayback machine, we can turn to the work of Chris Wilds, who created a website about his experiments with being a being a Retronaut. That is, a person who travels into the past by exploring perceptions of time. Whether by looking at old pictures juxtaposed with new ones (which we experimented with at CNN iReport a few weeks ago) or hunting anachronisms, Wilds' site hints that time travel may be all in your head. UK drivers had better stay under that speed limit, because the traffic authorities are watching… from outer space. According to The Telegraph, an American company called PIPS Technology has developed a system that uses two cameras on the ground and one mounted on a satellite in orbit to catch speeders. The system - called “SpeedSpike” - figures your average speed between two points, captures an image of your license plate and reports you if you’re going faster than the law allows. Oh, and if you’re hoping Great Britain’s notoriously gray weather will save you, you’re out of luck; the system works even when it’s cloudy or dark. NASA released new photos today of everyone's favorite former planet: Pluto. 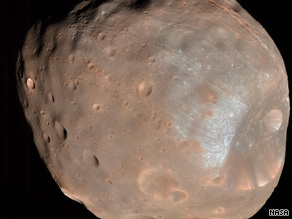 The space agency says the photos, which were taken in the early 2000s by the Hubble Space Telescope, are the "most detailed and dramatic images ever taken of the distant dwarf planet." "The Hubble pictures confirm Pluto is a dynamic world that undergoes dramatic atmospheric changes not simply a ball of ice and rock," NASA says in a news release. 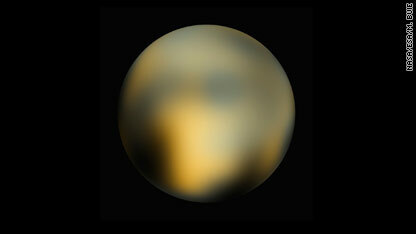 But the new glamour shots won't be enough to get Pluto registered again as a planet. Pluto is unlike Earth, where the planet's tilt alone drives seasons. Pluto's seasons are asymmetric because of its elliptical orbit. Spring transitions to polar summer quickly in the northern hemisphere, because Pluto is moving faster along its orbit when it is closer to the Sun. The surface appears reddish, yellowish, grayish in places, with a mysterious bright spot that is particularly puzzling to scientists. Some of the colors revealed in the new pictures of Pluto are thought to result from ultraviolet radiation from the sun interacting with methane in the tenuous atmosphere of the dwarf planet. The bright spot apparent near the equator has been found in other observations to be unusually rich in carbon monoxide frost. Pluto lost its status as our solar system's ninth planet in 2006 when an international group of scientists decided that it was too small and too distant to be considered a member of the Earth's solar-system family. Pluto is considerably smaller and more distant than the other planets in our solar system. Two-thirds the size of Earth's moon, Pluto's classification as a planet came under scrutiny when many objects of similar size and distance were discovered in the Kuiper Belt in the 1990s. This is too weird: A bird reportedly has dropped a "bit of baguette" onto the world's largest atom smasher, causing the machine to short out for a period of time. It's just the latest mishap for the Large Hadron Collider, or LHC, which scientists plan to use to get insight into the universe's origins. The LHC, which has a 17-mile track to circulate protons and is located underground on the French-Swiss border outside Geneva, Switzerland, is the largest particle accelerator in the world and cost about $10 billion. The LHC booted up in September 2008, but technical problems forced it to shut down shortly after its launch. When the mystery bird reportedly dropped a piece of bread onto the particle accelerator's outdoor machinery earlier this week, the device was not turned on, according to reports, and therefore did not suffer major damage. Had the machine been activated, the baguette incident could have caused the LHC to go into shutdown mode, the UK's The Register reports. The Register quotes Dr. Mike Lamont, a worker at the European Organization for Nuclear Research (or CERN), as saying that "a bit of baguette" had been dropped on the LHC, possibly by a bird. 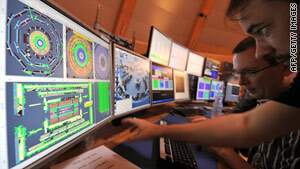 A call to CERN's press office was not immediately returned. The [CERN] spokesperson said the bread, which was "naked and unfilled", had caused a short circuit when dropped on an electrical installation that supplies energy to the massive experiment. While the bird was unconfirmed as the definite culprit, it had been spotted beforehand near the substation carrying bread, said the spokesperson. We're not ones for crude for national stereotyping, but the detail that the bird dropped a bit of baguette suggests this must have occurred on the French side of the LHC. It's unclear whether the bird was actually riding a bike, or indeed wearing onions and a beret. A Discover blog exclaims: "Zut alors!" And CrunchGear says the strange incident shows the LHC is "so abhorrent to nature that the universe is contriving to snuff it out." Only 12 men have had the honor of walking on the moon, but six astronauts were in charge of getting them there and bringing them home safely. These were the command service module pilots, whose job it was to circle the moon and return to Earth - without setting a foot on the lunar surface. These six people are often overshadowed by the moonwalkers. Their stories are worth telling, though, especially in honor of the upcoming 40th anniversary of the first lunar landing. The first CSM pilot is the most famous. 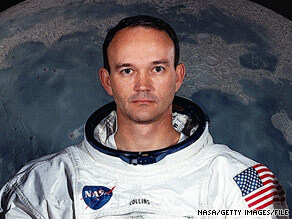 Michael Collins flew on the Apollo 11 mission, carrying Neil Armstrong and Buzz Aldrin to the moon for the first lunar landing. He circled the orb for nearly a day in solitude. For 48 minutes out of each orbit he was out of radio contact with Earth. In his autobiography, Collins wrote "this venture has been structured for three men, and I consider my third to be as necessary as either of the other two." He also said he never felt lonely, but "awareness, anticipation, satisfaction, confidence, almost exultation." Richard Gordon, commander of the Yankee Clipper – the Apollo 12 CSM, was the second to orbit the moon while others walked on the surface. While he circled, he mapped out potential landing sites for future missions. He was slated to walk on the moon in the Apollo 18 mission, but that mission was canceled. Stuart Roosa spent 33 hours in orbit during Apollo 14. His skill as the CSM pilot was needed after initial attempts to dock with the lunar module failed. Alfred Worden was listed in the Guinness Book of World Records as the “most isolated human being” while he was orbiting the moon during the Apollo 15 mission. When the Endeavour was at its greatest distance from the lunar crew, Worden was 2,235 miles away from any other human being. Ken Mattingly is probably well known for his actions on the ground of the ill-fated Apollo 13 mission, but he finally did get to go to the moon for the Apollo 16 launch. Mattingly used instruments aboard Casper to map a stretch of the lunar surface all around its equator. The final mission, Apollo 17, put Ronald Evans in control of the command module, America. Evans holds the record of more lunar time in orbit than anyone else: 147 hours, 48 minutes. Each of these men spent countless days training next to their more-heralded moonwalker colleagues. Yet, while their capsule brethren actually touched another heavenly body, these brave astronauts could only stare out their window and marvel at the view. 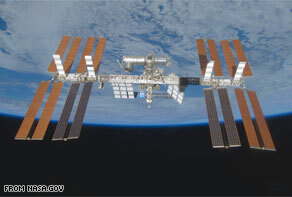 After a decade of costly construction, the International Space Station is nearing completion. But NASA won't have long to enjoy the achievement. According to an article from the Washington Post, NASA space station program manager Michael T. Suffredini raised eyebrows when, at a public hearing last month, he declared flatly that NASA plans to de-orbit the station in 2016. That means the $100 billion research facility, which has been circling Earth since 1998, will ultimately burst into flames as it reenters the Earth's atmosphere and crashes into the Pacific Ocean. Budget constraints and the lack of a shuttle program, which is set to retire in 2010, may have persuaded NASA to end the space station program. 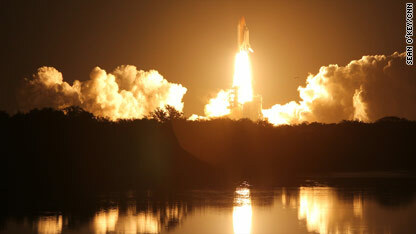 The rap on the space station has always been that it was built primarily to give the space shuttle somewhere to go. Now, with the shuttle being retired at the end of 2010, the station is on the spot. U.S. astronauts will be able to reach the station only by getting rides on Russia's Soyuz spacecraft. 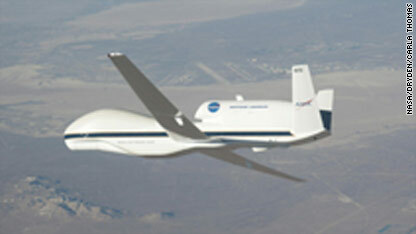 There is no official lobbying to extend the mission, but NASA's plans have met with criticism. Sen. Bill Nelson (D-FL) argues, "If we've spent a hundred billion dollars, I don't think we want to shut it down in 2015." While speaking to a panel charged by the Obama administration with reviewing the entire human spaceflight program, Nelson affirmed, "My opinion is it would be a travesty to de-orbit this thing... If we get rid of this darned thing in 2015, we're going to cede our leadership in human exploration." 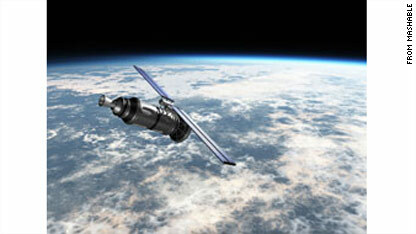 What do you feel should be done with the International Space Station? Does the initial $100 billion investment justify extending the program, or should we simply cut our losses and look toward a new future of space exploration?